Of Course, Blossoms. But Wait. 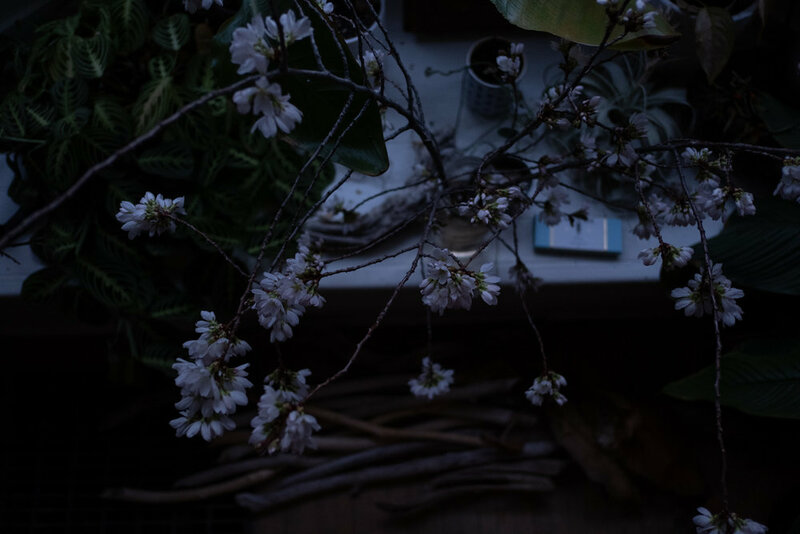 For the past four evenings I sit in the quiet of my living room, watching the light fade into a quiet blue around a few blossoming branches my studiomate allowed me to steal. I took just three branches from a large pile she’d collected after a wind storm and laid to rest on a blue tarp in the middle of the floor. I took them for their shape, their utility for a project I had in my mind. I was going to make something of them. But I didn’t make anything. Instead I found myself barely trimming their ends, and placing them in a large mason jar full of water. I put them in the bay window and hummed to them along with my other plants. Spring is an especially good humming time of year. Humming softens every bit of me. I hum Ella Fitzgerald, Jolie Holland, and some Hindu incantations. I didn’t make anything. I decided to let the creation of a thing go on. I would quietly witness it and offer a song here and there. The blossoms are not the fruit, but a reminder of things still yet to com--to fruition. 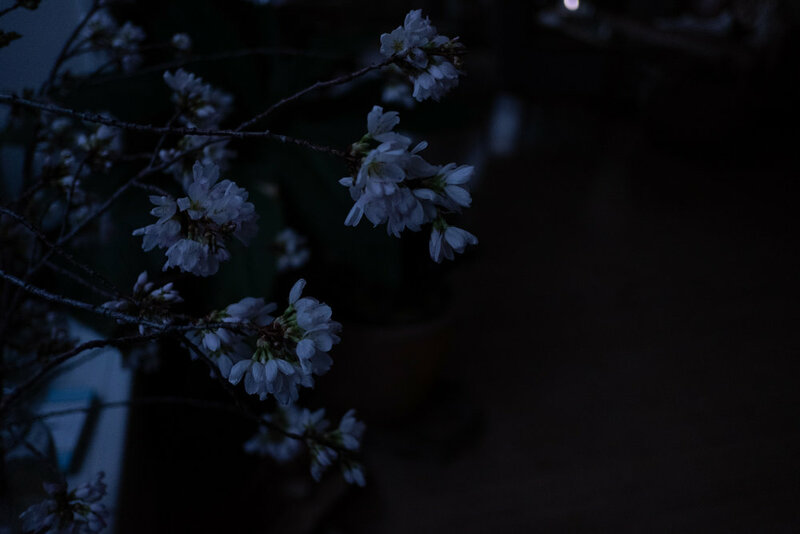 These delicate blossoms are there to say, “not yet, but slow down and enjoy the beauty of this moment, this phase.” They are fragile, so be gentle. Take in this soft place because it will not last. This is nature’s creative way of giving us a sign: this is growth, and something will indeed come of it. We cannot make it happen. We can only wait, watch, and take in the beauty. All winter we lived through many dark hours, incubating seeds that we hoped were being well-nourished by our imagination and small efforts. One gesture at a time. We’ve made it. The roots have reached down into the earth for the nourishment of soil, and one set of roots have surfaced, reaching for the sun. The seed celebrates into blossoms. Yes, we are not only surfacing, but doing so with beauty. For any soul who is willing to stop and witness what we are becoming--not what we are making. 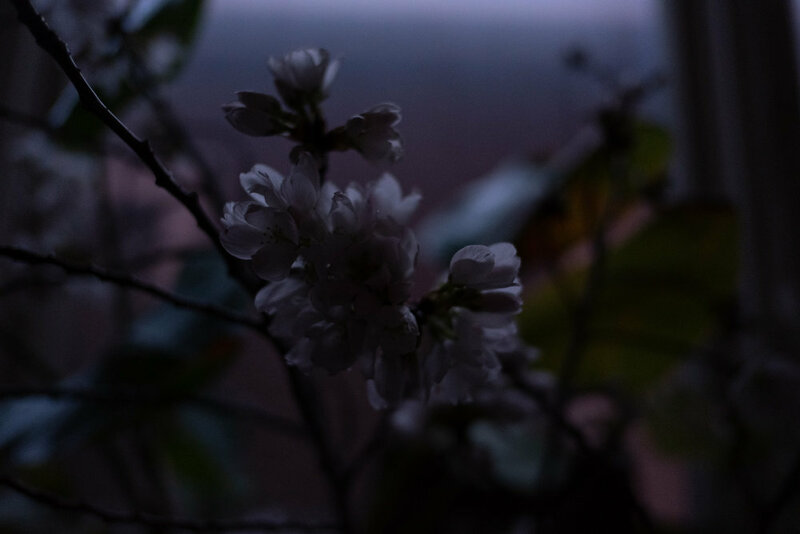 I know one day I will miss these few quiet moments when the blossoms met the light of a threshold, of day crossing into night. And one day there will be fruit; there will be harvest. Wait. In beauty, in silence, in the softness of spring blossoms. Because one day, too, there will be winter again and the seeds will incubate in darkness, beginning the cycle once more.